The Province of Batanes tour explores the picturesque rugged beauty of the islands of Basco and Sabtang showcasing how nature and men have adopted with each other for over the years sans the trimmings of modern life. The original buildings made of limestone and thatch cogon roofs make Batanes Province a class of its own maintaining its rough and rugged beauty and virtually safe from the harsh elements of nature. The relative distance of Batanes from the rest of the country and the limited open season it offers to travelers makes travel to Batanes all the more promising, exciting and definitely, a bucket-list entry. Daily flights are available from Manila through Philippine Airlines while WCC Sky Pasada flies from Tuguegarao City three times a week. Arrival reception; whole day exploration of Basco town: St. Dominic’s Cathedral; Chawa Viewdeck; Racuh-a-Payaman – the communal pasture land; Radar Tukon and the Old Loran Station – the last weather station in the north of the country; Pacita Abad Museum; St. Carmel Church and walking tour of the town proper including commercial area and St. Dominic Restaurant for organic beef delicacies. Sabtang Island Trip: Proceed to Barrio Savidug, drop by Sitio Tiñan for its rockscapes and seascapes; Chavayan, known for its preserved stonehouses ; Sitio Morong – enjoy Morong Beach with its picture perfect Ahaw (Arc) and explore Nakabuang Cave; Nakanmuan for the fishing village and bring home dried fish or one-day old Dibang (flying fish); enjoy local cuisine at the Homestay; overnight. Early trip back to Batan Island; Ivana Church and climb the crenelated belltower fortress for a good view of the sea and town; souvenir shopping at the Honesty shop; motor to the Hose of Dakay; Mahatao Church and leave your message at the Open Books Archive; romp and roll at the Valugan Boulder beach, Vayang rolling hills and Naidi hills. Motor to Mahatao at the Fishermen’s Village at Brgy. Djura to explore the old settlements, swim at the spring-fed pools; souvenir shopping in the afternoon. 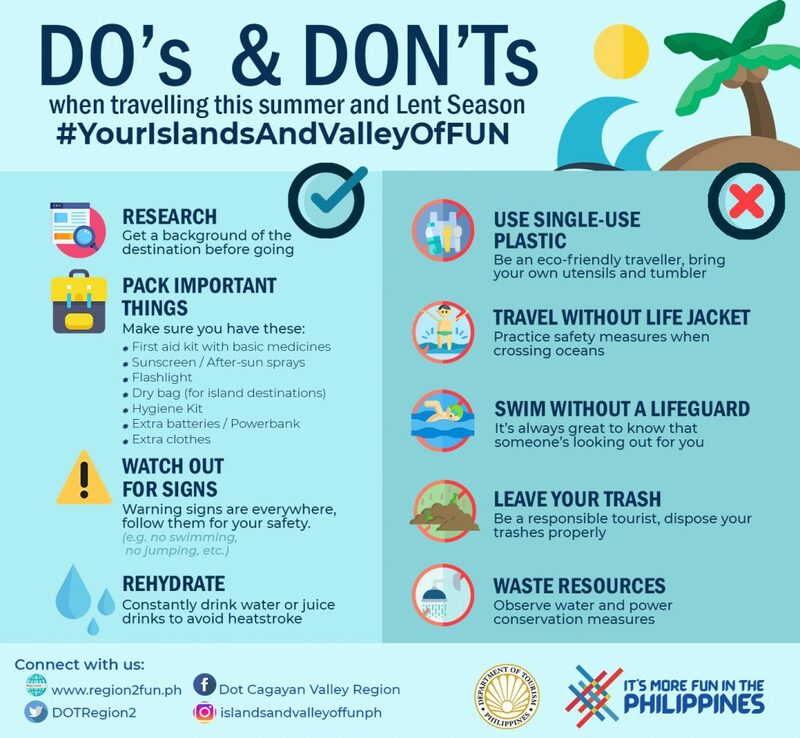 The Province of Cagayan is a never-ending adventure of caves, forests, waterfalls, beaches and centuries-old churches backed-up by hospitable Cagayanos and supported by well-maintained road system. Visitors will not only be treated to a worthwhile trip but also a gastronomic adventure of local cuisine and delicacies. Daily flights and evening buses traveling to Tuguegarao City will make travel to Cagayan an absolutely seamless experience. Philippine Airlines and Cebu Pacific flies daily from Manila to Tuguegarao City, the capital of the province. Comfortable night buses offering aircon buses like Deluxe, First Class and Sleeper Type are available daily. Arrival Reception; motor to Sta. Ana; visit the Boacag Waterfalls, exploration, swimming, bring change of clothes; visit the Fr. Gerry Felipetto Museum. 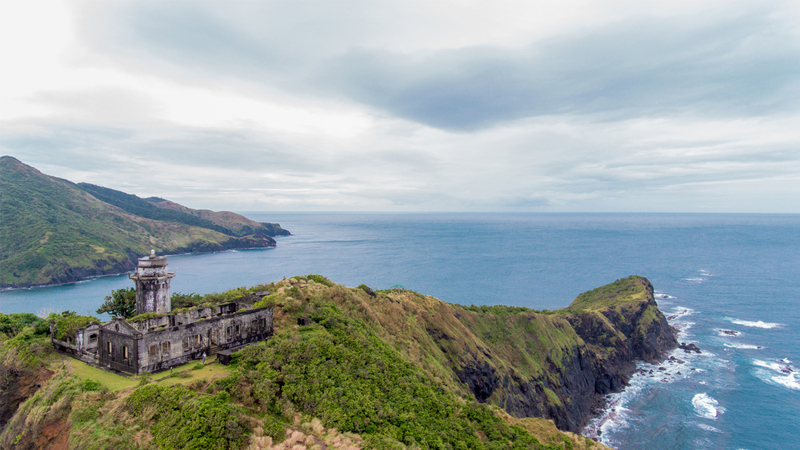 Early morning trip to Palaui Island: sunrise viewing at the Manidad Island; explore Cape Engaño lighthouse, second growth old forest; try snorkeling and scuba diving with ecoguides and take your lunch at the Nature Village, the venue of Survivor 27-28 episodes. Motor to Claveria in the afternoon. Explore the mile-long black fine sand beaches in Claveria, swimming or volunteer to help haul the fishnets of local fishermen; go to Taggat Lagoon and chance upon the fisherfolks bringing in their catch from the sea; motor to Tuguegarao City. Visit local restaurants and try the Pancit Batil Patung; motor to the Cagayan Provincial Museum and Historical Research Center and Callao Caves Tourist Zone to explore Callao Cave; take boat upriver along Pinacanauan River for swimming or kayaking; watch the circadian flight of bats at dusk before driving back to the city. Early morning trip to Piat Basilica Minore, exploration and attend Mass; souvenir hunting in the afternoon for bring home gifts like Tuguegarao Longganisa, carabao milk candy, peanuts, chicharabao. Take night bus back to Manila. Explore and experience the Isabelino culture and tradition. Enjoy the outdoors with friends and families. Combine business with pleasure for your all-in-one trip in the province where the business environment and love of nature is very upbeat. Accessibility will never be a problem since Isabela is at the heart of the Cagayan Valley Region. Cebu Pacific flies from Manila to Cauayan City four times a week or take the night buses like Victory liner and Florida Bus Lines traveling to Tuguegarao City. Arrival Reception. If taking the plane, lunch al fresco at a Farm Tourism establishment in Cauayan City. Motor to Ilagan City; visit and explore the Ilagan Sanctuary caves, waterfalls, zoo and enjoy the outdoor activities like zipline ride, cable car, rock climbing, treetop adventure, wall climbing and others. Take Cyclone Plane from Cauayan City Domestic Airport; reception with Guides at Palanan Airstrip. Visit the Emilio Aguinaldo Memorial Marker. Trek to the Palanan river and explore the town on foot; listen to a lecture and introduction to natural history at the PWDECO souvenir shop. Enjoy a uniquely unforgettable cruise along Palanan River passing by Dibungco, the first Agta organized community; Culasi mangroves and Palanan Bay; Pacific Ocean view and Northern Sierra Madre Mountain and Brgy. Dicotcotan. Brgy. San Isidro is sheltered from the Pacific Ocean by Palanan Point’s barrier reefs for homecook lunch overlooking the sea. The rest of the day will be spent exploring the beach, forest and the mobile leanto’s of the Palanan Agta and a refreshing dip at the crystal waters of the sea. Jungle trek and nature related activities with cultural immersion will be the day’s agenda including a trek to Disadsad Waterfalls passing by fishing villages or farming villages. Explore the waterfalls area from top to bottom by climbing the mountain walls or enjoy swimming at its basin. Trek to the 16 hectare biological plot in Villa Robles. Venture inside the ecosystem and discover the rich biodiversity of Palanan and the dynamics of rainforest ecosystem. A Forester will lecture on the importance of preserving the natural habitats at the Northern Sierra Madre Natural Park while exploring the area. Farewell dinner will be served. Fly out of Palanan in the morning; souvenir shopping at Cauayan City while enjoying the local delicacies; take early evening bus back to Manila or catch the plane back to Manila in the morning. Arrival Reception. If taking the plane, lunch al fresco at a Farm Tourism establishment in Cauyan City. Motor to Lower Magat Ecotourism Park in Diadi; explore the outdoors, visit indigenous houses, swimming, horseback riding, trekking, fly fishing, others. Motor to Kasibu town; explore the fifth longest cave system – Capisaan Cave and enjoy the culture of the Kalanguya tribe; overnight stay at a Homestay. Visit the orchard farms featuring citrus products and other tropical fruits; pick and pay; motor to Ifugao Rice Terraces in the afternoon for overnight stay. Explore the terraces and enjoy the culture of the Ifugaos; shop for gifts to bring home; take the afternoon bus to Sta. Fe town, overnight stay. Take the local transport to Imugan Waterfalls, exploration and swimming; motor down to the 24-hour Sta. Fe shopping highway; take the bus back to Manila anytime. Let the Province of Quirino be where your eco-adventure begin with the undiscovered natural beauty of the province. With its waterfalls, rivers and caves. Make the trip to Quirino your bench-mark for nature adventure with its unspoiled beauty for only a few have dared to leave their stamp in this place. Cebu Pacific flies from Manila to Cauayan City four times a week or take the night buses like Victory liner and Florida Bus Lines traveling to Tuguegarao City. Get down at the junction of Cordon town and take the local transport. Arrival Reception. If taking the plane, lunch al fresco at a Farm Tourism establishment in Cauyan City. When in Quirino, explore the Aglipay Caves and Campsite with 38 cave systems including a subterranean cave; surrounding forest and plantation offers a horse-back-riding experience, trekking and communing with nature. Explore and swim at Maddela Waterfalls and Forest Reserve; boating at the Governor Rapids and visit the Agta community who live by the riverbank all year round; wall climbing, rock climbing and exploration. Motor to Nagtipunan for an exhilarating water-tubing experience within the Cagayan River while enjoying the natural beauty of the forest area and local tribes, enjoy local food. Back to Cabarroguis to shop for gifts to take home like ginger tea, local peanuts and banana chips; visit the local market for local produce to take home as well. Take the night bus back to Manila.